Summer is an ideal time to escape from the rat-race and experience the exquisite, mysterious living landscape of the Maloti Drakensberg mountains. The scenery is green, flowers are blossoming, and dramatic afternoon thunderstorms take the edge off the heat. The formidable cliffs, rocky gorges, rugged mountainsides and wilderness areas contain an abundance of life and a colourful kaleidoscope of cultures. The lush indigenous forests offer cool respite from a hot day’s hiking. The grass-lands contain an amazing array of flowering plants and small animals. The Maloti Drakensberg region is renowned for its rich biodiversity. It contains many species of fauna and flora that are found nowhere else in the world. The grasses alone display great diversity, being represented by more than 100 species. Among the larger animals are baboons and antelope such as Eland, Oribi and Rhebuck. If you are lucky you can see Black-backed Jackal, Serval, and Caracal. The uKhahlamba Drakensberg Park incorporates 200 km of the Drakensberg, ranging in altitude from 1600 metres to higher than 3000 metres above sea level. It was declared a world heritage site due to its globally significant biodiversity, rich cultural and historical significance, and exceptional natural beauty. The captivating human history of these mountains dates back many thousands of years to the Stone Age. Much of the San rock art is still intact. Wars and migrations have led to the area being occupied by many different people who over the centuries, reflected in the fascinating and diverse cultures of the people living in the region today. The region is home to 26 different ethnic groups – many of whom still live a traditional way of life. The people and their interwoven histories have created a complex tapestry. Become immersed in layer upon layer of their interlinked experiences as you visit these sites today. There’s far too much to explore overnight, which is why people keep coming back. Here are three venues you’ll want to come back to, too. Thendele Camp is located at the foot of the iconic uKhahlamba-Drakensberg Amphitheatre, a rock wall 5km in length and some 500m in height. The world- famous Chain Ladder is the link to exploring the vast wonders of the iconic uKhahlamba- Drakensberg Amphitheatre summit. The cascading Tugela Falls in Royal Natal is one of the world’s highest waterfalls and the ideal backdrop for a picnic. Queens Causeway is a wheelchair friendly boardwalk following the Mahai River. Thendele is split into an upper and lower section, has 14 two-bed chalets with a bathroom, dining/lounge areas and kitchen and 12 four-bed chalets with two bedrooms, a bathroom, dining/lounge areas and a kitchen. 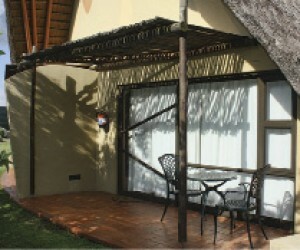 Thendele offers two six-bed cottages with three bedrooms, one bathroom (separate toilet), a large lounge and dining room and a kitchen. Thendele Lodge, a six-bed luxury lodge with three bedrooms, each with their own private bathroom, a spacious lounge dining room and a kitchen. Satellite television is also available. Resident cooks can prepare meals with food supplied by the guests in the two six-bed cottages and the lodge. The curio shop has a wide range of curios and sells basic groceries and supplies. The Didima Rock Art Centre offers insight into the rich art and culture of the San. Didima’s Conference Centre venue provides one of the most scenic venues for weddings and functions. Mike’s Pass offers the unique opportunity to drive or cycle to the top of the little berg for a panoramic view of the escarpment. Cathedral Peak is a hikers’ paradise, with its many hikes ranging in duration from one to several days. A local map with details on eight different walks commencing from the resort is available at the reception office. In terms of accommodation, Didima Resort features 63 two-bed chalets, two four-bed, luxury honeymoon suites and one six-bed bungalow. Each of the two-bed chalets are connected by an inter-leading doorway allowing the two chalets to be converted into a four-bed family unit with self-catering facility. In addition, Didima features two four-bed chalets with two bedrooms each en-suite, a lounge/dining area and one six-bed chalet with three bedrooms, a lounge/dining area and a kitchen. Didima Resort’s restaurant and bar provides guests with the option of fully catered meals in its warm and relaxed atmosphere. For those who prefer to sleep under canvas, the Cathedral Peak Community Campsite offers 30 camping and caravan sites with electricity that can accommodate a maximum of 6 people. Campers are to pay the fees at the reception. The communal ablution facilities have toilets, hot showers, baths and a communal kitchen. Braai stands are available, with firewood and charcoal for sale at the Curio Shop. There are also 12 caves that sleep a maximum of 4-12 people per cave where visitors may overnight. It is essential to book these in advance. 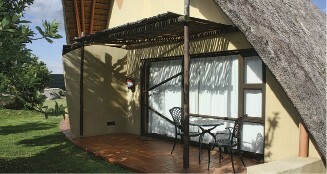 Giant’s Castle camp is themed to the wild flowers of the Drakensberg. Each accommodation unit has been named after a plant family and contains original artworks of the berg flowers by well-known artists. Accommodation consists of a six-bed Rock Lodge with a cook in attendance; 37 two-bed-chalets with en-suite facilities, a lounge/dining area and fully appointed kitchens; three four-bed chalets with two bedrooms, a bathroom, a lounge/dining area and a fully equipped kitchen; and three six-bed chalets featuring three bedrooms, one bathroom (with a combination of bath/shower), a lounge/dining area and a fully appointed kitchen, and a romantic honeymoon suite. Giant’s Castle also has a two-bed Paraplegic Unit. All units are equipped with satellite TV. There are also two caves in the reserve, Giant’s Cave sleeps eight and Bannerman Cave sleeps six people. The Drakensberg Montane Forests are found at the mid- to upper elevations of the uKhahlamba Drakensberg Park, and can be easily reached on most of the walks in the park. Here you will find lush, cool forests with trees such as Yellowwood, Mountain Hard Pear, Cape Chestnut, Cape Holly and White Stinkwood. In the shelter of these forest you can also find small plants such as the wild Orange Begonia, the striking purple streptocarpus gardenii, and the orchid Disperis fanniniae. The good examples of these forests are found on the walk up the Tugela Gorge at Royal Natal National Park, and the Rainbow Gorge walk that is accessed from Didima at Cathedral Peak. The birding in Giant’s Castle, with over 100 species, is tremendously rewarding, even on short walks. You may see Bearded Vulture, Verreaux’s (Black) Eagle, Jackal Buzzard, Lanner Falcon and Cape Griffon (Cape Vulture). Small birds include Ground woodpecker, Yellow Warbler, Broad-tailed Warbler, Grass-bird, Spotted Prinia and Fairy Flycatcher. Deeper into the mountains you could see Grey-wing Francolin, Blue Crane and Yellow-breasted Pipit. Near the top you should see Orange-breasted Rock-jumper and Drakensberg Siskin, amongst others. The vulture hide at Giant’s Castle offers spectacular close-up sightings of the vultures and buzzards.